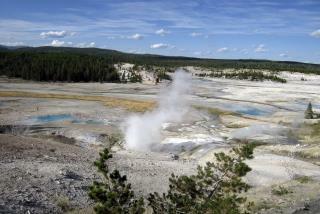 (Newser) – A man who left the boardwalk in a highly dangerous area of Yellowstone National Park was looking for a place to swim but ended up being dissolved in a hot spring, according to the final official report on the June 7 accident. The report states that Oregon man Colin Nathaniel Scott, 23 and his sister Sable Scott were looking for a place for soaking, or "hot-potting," KULR-8 reports. The sister told authorities that her brother was reaching down to check the temperature of a pool around 225 yards from the boardwalk when he slipped and fell into what turned out to be a boiling, acidic pool. Deputy Chief Ranger Lorant Veress describes the area as a "very unforgiving environment." Life is like a hot bath. It feels good while you're in it! But the Longer you stay in,the more DISSOLVED you get! There ya go ALL! Aaaagh!! D'oh!! I also did not know the hot geysers contained acid. Now I do. I remember an episode of "Rawhide" where a John Barrymore, Jr. character was executed by some of his own people by being tied to a geyser. At the time I wondered if that could be true. Now I know, don't I.